CENTRAL — In a classic showdown for the District 4-5A Championship last Friday night, the Scotlandville Hornets dominated the Central Wildcats in the first half. Fortunately for Central, the Hornets led at half time by only 13-0, although the game seemed more one-sided than that. Nevertheless, the Wildcats battled back in the second half, showing a lot of emotion, especially after two key fumble recoveries, and won the game and the District Title by a narrow 26-25 margin. 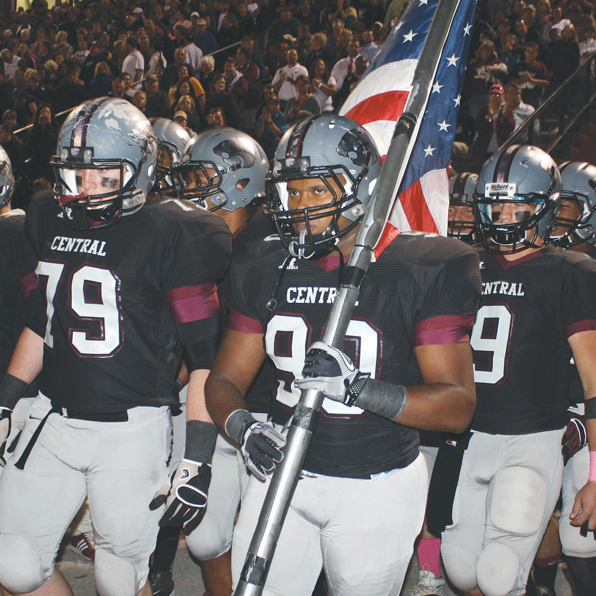 One memorable tackle by Central’s Dillon Brumfield made a pop heard throughout Wildcat Stadium. Brumfield hit the Hornet quarterback so hard that Brumfield’s helmet cracked, and he had to scramble to borrow a replacement helmet from a teammate. “I told our guys no lead would be safe, and no deficit too large to overcome. The game went back and forth. Fortunately, we had the ball last!” he said. Both teams entered the game 3-0 in district play. Now Central is 8-1, 4-0 in district, and ranked No. 7 in the state in power ratings. The victory included three touchdowns by senior running back Lamonte Janeau and an outstanding performance by the offensive line. Coach Sid commended the coaching staff, especially defensive coordinator Ken Hilton, who led the Hornets as head coach until this season. • Thomas Eddlemon, Tony Ragusa, John Milton, Ashton Stokes, Dalton Holmon, and Corey Guercio, all of whom had great games against the big boys. With less than five minutes left in the game, Central was behind 25-19, when it scored the winning touchdown. Live Oak at Home. Although Central has cinched the District Championship, it has one hone remaining regular season game — against rival Live Oak this Friday night at home. The Live Oak game has all the makings of a potential upset. Central has dominated Live Oak in recent years, but this is a completely different Live Oak team. They proved that last week when they upset Zachary. Coach Sid said Friday will be a Pink Game at Wildcat Stadium. Donations will go to Mary Bird Perkins Cancer Center.